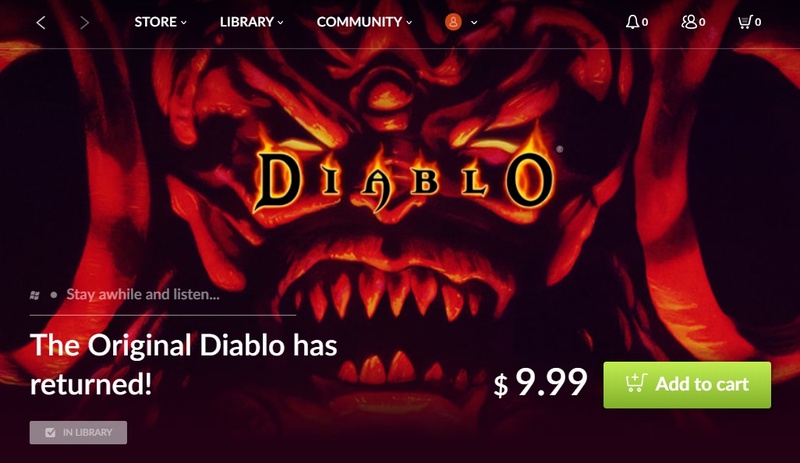 While Valve was out making itself look bad in front of the world, Blizzard and GoG.com were conspiring to bring back a video game classic, the original Diablo. Seeing the news about this over at Ars Technica, I immediately went to GoG.com and bought a copy. You actually get two versions of the game for your $10. There is Diablo (Classic), which is pretty much the original game, fixed up a bit to run, and able to get onto Battle.net. 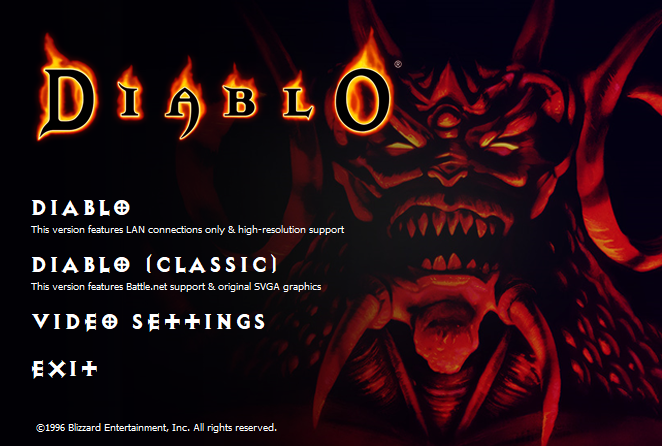 Then there is the GoG.com Diablo, which has been jiggered to run better and scale to larger monitors. Having tinkered with the original Diablo on Win7 a couple years back… you could get it to run, but there were some quirks to be sure… I was keen to try the GoG.com version. And, just a ways in, I can say it sure feels like the real deal. I got in and went straight for the dungeon looking for an old friend. The game looks and plays like it is 1997 again… which means the graphics are crap and the whole thing feels extremely primitive. But it is true to the times. After all, I think my phone has more processing power than every computer I owned during the 90s combined. And it certainly has better graphical resolution than any monitor I owned. And then there is the way the game plays. 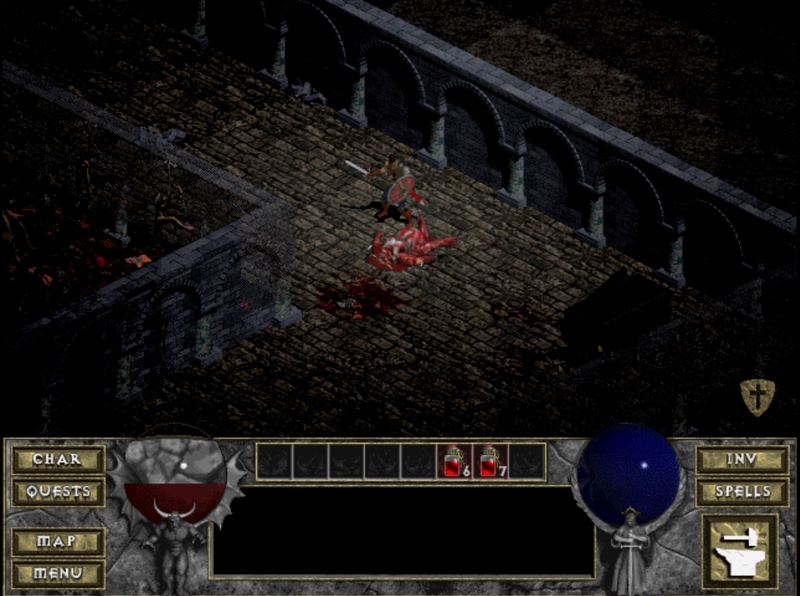 A lot of what I think of when it comes to the Diablo series comes from Diablo II. It took the original and lifted it, improving the game in many ways. So I was reminded how things used to be… like there being one potion per hotbar slot. 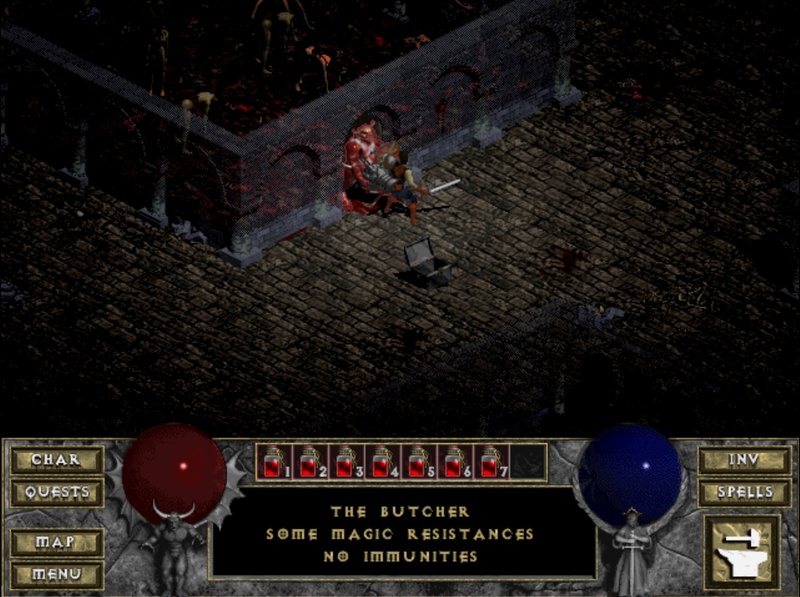 Were there belts in the original Diablo? Or was that a D2 thing? And then there is the fact that when your gear runs out of durability it is destroyed. I lost almost all of my gear fighting the Butcher, but I killed him in the end. And a good thing too, I needed that weapon. It is also hard to just find loot on the dark dungeon floors. I don’t think that is just because my eyes are 20+ years older now. I doubt this is a game that will impress anybody not old enough to have played it when it came out. Back then it was a revelation. The Blizzard North team got a lot of stuff right. It is sure more authentic than the Darkening of Tristram event that Blizzard put into Diablo III. Blizzard goes on in that post I linked about not being able to put it into the Blizzard launcher because it doesn’t tie into the current back end architecture, but that begs the question. Blizzard has the kind of resources to fix or update the code. However, they let GoG.com do the improvements. I mean, good for GoG.com and all. They just had some layoffs so something that helps support them is probably a good thing. Maybe they have the retro-restoration experience that Blizzard does not for this sort of thing. And it sounds like they may get to do similar work with Warcraft and Warcraft II. All of which is great, but I still want a full remaster of Diablo II. This entry was posted in Blizzard, entertainment and tagged Diablo, GoG.com, Nostalgia on March 9, 2019 by Wilhelm Arcturus.